Shane Smith has been with Vice Media from the beginning -- but Vice may be preparing for life without Smith as its top executive. Smith, the brash co-founder of the milennial-centric media company, could soon step aside as Vice's CEO, according to multiple media reports. A source familiar with the matter told CNNMoney that Vice is in advanced talks with A+E Networks CEO Nancy Dubuc to replace Smith. The source said Smith and Dubuc have had a close relationship for years, and that Smith would likely stay on in a different role. Vice did not respond to multiple requests for comment, but A+E's co-owners, Hearst and The Walt Disney Company, confirmed Dubuc's departure in a press release on Monday. In a statement, Dubuc spoke glowingly of her time at A+E, where she spent almost 20 years. But there was no mention of a new role at Vice. "Every step of my career, I have had the opportunity to learn and grow from some of the most inspiring and innovative minds at A+E and in both the creative and business community," Dubuc said. I could not be prouder of what we achieved together." Dubuc will be replaced on an interim basis at A+E by Abbe Raven, herself a former CEO of A+E Networks. It's a potentially watershed moment for Vice, the much-ballyhooed, Brooklyn-based upstart. The company began in Canada in the 1990s as a music and culture magazine before evolving into the well-funded multimedia juggernaut it is today. Smith has been CEO every step of the way, helping shepherd Vice's rise as both top executive and company cheerleader. An outspoken personality, Smith has even featured prominently in Vice's programming through the years. But Vice currently finds itself in a precarious position, facing serious questions about its long-term financial viability and workplace culture. A report last month in the Wall Street Journal indicated that Vice missed its revenue target for 2017 by more than $100 million. And last year ended with Vice addressing a damning report in the New York Times on an alleged history of sexual harassment and misogyny within the company. Vice placed two top executives who were named in the story on leave; one of them resigned in January. In 2015, Vice launched its 24-hour channel, Viceland, in partnership with Dubuc's A+E Networks. 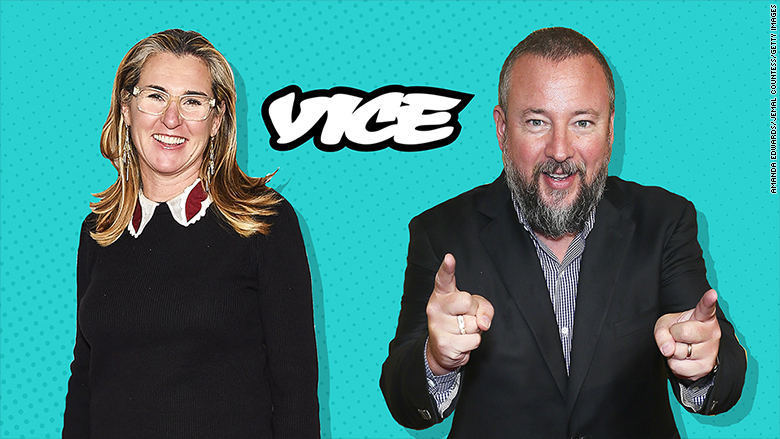 Now Viceland could represent another potential challenge for Dubuc if she does take over at Vice, as the channel has struggled to cultivate an audience.